Hi All! I’ll be posting a series of recipes that are fantastic to make at home as real crowd pleasers, ideal for dinner parties or if you just want to whip out something amazing for the hell of it. In line with everything we do at TC, they’re designed so that even if you’re not an experienced cook, you’ll be entirely capable of making them and maybe learn some handy skills along the way. The first two are based around Thai Red Curry Paste, something we get participants to make themselves in our Team Cooking Events. 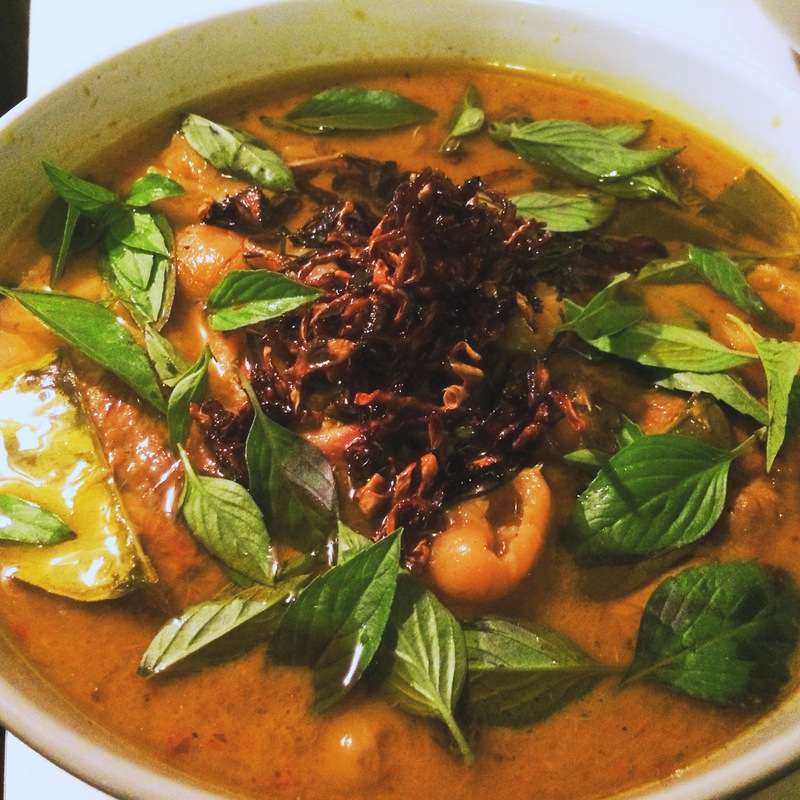 It’s amazingly versatile, in fact we use it in 7 totally different dishes in our programs – Red Curry of chicken in Coconut Milk, Khao Soi (like a northern thai laksa), Northern Thai/ Burmese curry, Nam Prik Ong (a kind of thai ragu from Chiang Mai), Thai fish cakes, Larb Beef Salad and Whole Fish with Tamarind and Ginger sauce. Meanwhile, place coriander, cumin and peppercorns in a small frying pan over medium heat. Dry fry for 1 to 2 minutes or until fragrant. Allow to cool and crush in a mortar and pestle or spice grinder to a fine powder. Chop up the lemongrass, chilies, kaffir lime rind and galangal reasonably finely. Using either a mortar and pestle or food processer, grind/ pound until fine. If you are using fresh turmeric, do the same for this as well. Add in shrimp paste, salt and ground spices. Use some of the preserved chili water and additional peanut oil to process until until a smooth paste forms. There’s a lot of conjecture around what should go in a Thai curry paste. I’ve certainly changed the one we use extensively over the years as a product of various conversations with local Thai cooks, courses I’ve done and research. I even had a long conversation with a lady I met on a plane (MKR winner Jennifer Evans – I had no idea!) who was working on her own range of packaged curry pastes who claimed they should contain NO spices. Not the path I have gone down, though as a consequence, I overhauled the current recipes to reflect a more compact and punchy flavour profile. You might be looking at the above recipe and going “Jeezuz, I don’t have time for all of that” and I understand. 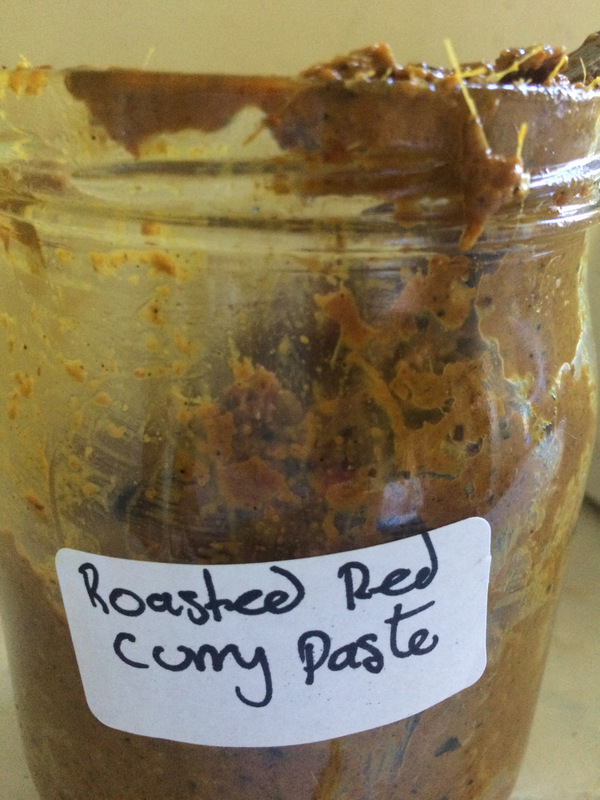 I’ve used commercial curry pastes in the past and they’re a great way to make delicious food quickly. Just make sure you use a decent one such as Maesri (little tins) or May Ploy (larger plastic bucket), not some slop in a jar from Woollies. That said, if you must fraternise that a den of iniquity, I’ve seen both those brands on the shelves there. You’ll have a much nicer experience though if you go to your local Asian grocer and it’ll save money too. Even better though, have a crack at our recipe . It’s not that hard, it’s really satisfying to make your own paste and it will take your food to a whole new level. It’s also very impressive to tell your friends or partner that you made it from scratch. It could be your new secret weapon! Traditionally you are meant to use dried red chillies. Get the milder ones. The last time I made this recipe I actually toasted rather than soaked them get a deeper flavour and itwas pretty damn good. Do a little taste test on yours before you hurl them in and adjust accordingly. The chillies are meant to provide not just heat but also flavour, so it’s important you have enough of them in there. I use the medium length Chinese variety that come in bags from Asian stores. I also use fresh chillies from the garden, or a combination of the two, especially if you’re roasting the dried ones as this takes some of the heat out of them. Normally available from Asian grocers, though if out of season, can be tricky to get. Scout around your neighbours and look for any trees with the double leaves and weird, lumpy fruit on them and stock up! Be polite and offer to exchange a jar of homemade curry paste for a bowl of limes and you might make a new friend. They freeze really well. You can also grow them very easily in Melbourne or further north. If you really can’t find them anywhere, substitute the rind of a regular lime plus 6 kaffir lime leaves. Just use a food processor. It’s easy, it’s quick and gets the same result. Don’t buy into all this superstition about how only crushing can release the oils properly and how the friction from blades denatures flavours and micronutrients. You’re going to be cooking all of this stuff and that is where the flavours get released. The rest is hokum.